Surgical management of oral pathologic lesions can best be discussed by broadly dassifying pathologic lesionsinto the following major categories cysts and cysrlike lesions of the jaws, benign tumors of the jaws, malignant tumors, and benign lesions of oral soft tissues. has eroded through the cortical plate, fluctuance may be .noted on palpation. FIG. 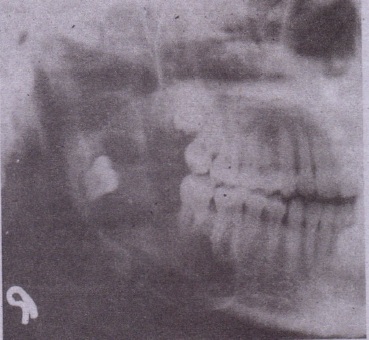 22-1 Mandibular third molar is displaced by cyst. 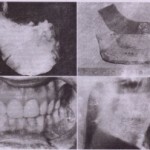 Cysts of the jaws are treated in one of the following four basic methods: (1) enucleation, (2) marsupialization, (3) a staged combination of the two procedures, and (4) enucleation with curettage. (which lines the interior aspect of the cyst) and the bony wall of the cystic cavity. This layer allows a cleavage plane for stripping the cyst from the bony cavity and makes enucleation similar to stripping periosteum from bone. 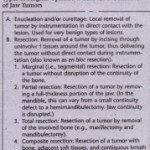 treated the lesion. The patient does not have to care for a marsupial cavity with cons.tant irrigations. Once the mucoperiosteal access flap has healed, the patient is no longer bothered by the cystic cavity. cons of enucleation versus marsupializatiofl (with or without enucleation) (see discussion of Lnucleatlon after Marsupialization) . smoothed with a file before closure. left Intact. The amount of osseous tissue is destroyed by cyst. FIG. 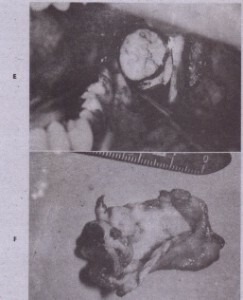 22-2-cont’d D, Cyst with buccal bone still attached, E, Mucosal closure is demonstrated. endodontic treatment of the teeth may be necessary in the near future, which may help to prevent Odontogenic infection of the cystic cavity from the necrotic dental pulp. can be used either as the sole therapy for a cyst oras a preliminary step in management, with enucleation deferred until later. teeth, marsupialization should be considered. 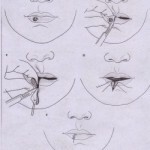 allow its continued eruption into the oral cavity (Fig. considerable bone fill has occurred. 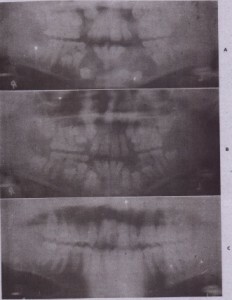 apices of teetn to other structures, such a5 maxillary sinus and inferior alveolar canal. al times every day with 11 syringe. This may continue for several months, depending on the size of the cystic cavity and. the rate of bone fill. wall. 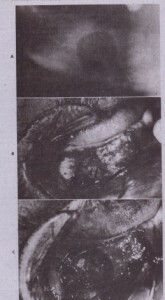 D, Oral mucosa and mucosa of cystic wall sutured together around periphery of opening. removes any residual fragments of debris. Areas or ulceration or thickening of the cystic wall should alert the clintcia I to tile possibility of dysplastic or neoplastic changes ill tile wall of tile cyst. In this instance enucleation of the entire cxst or incisional biopsy of the suspicious area or. 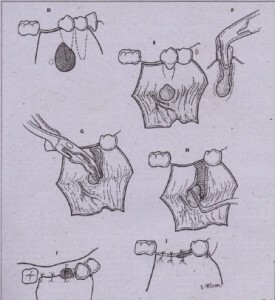 strip gauze il.ll’regnated with tincture of benzoin or an antibiotic ointment. This packing must be left in place for 10 to 14 days to prevent the oral mucosa from healing healing over the cystic window. By 2 weeks the lining of the cyst should be healed to the oral mucosa around the periphery of the window. FIG. 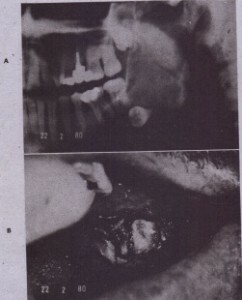 22-6 Marsupialization of multiple dentigerous cysts. A, Radiographic appearance before marsupialization. the cavity should not problem. 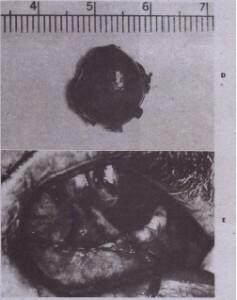 and a secondary enucleation may be undertaken without injury to adjacent structures. The combined approach reduces morbidity and accelerates complete healing 0 the defect. spares adjacent vital structures. 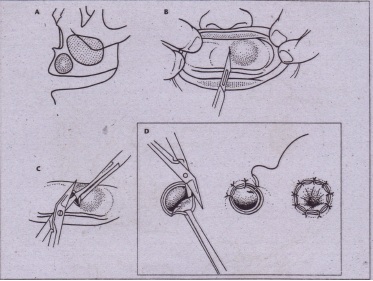 In the enucleation phase, the entire lesion becomes available for histologic examination, Another advantage is tile development of a thickened cystic lining, which makes the secondary enucleation an easier procedure. 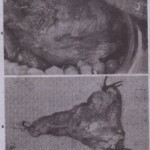 Technique, The cyst is first marsupialized, and osseous healing is allowed to progress. Once the cyst, has decreased to a size that makes it amenable to complete surgical removal, enucleation is performed as the definitive treatment. 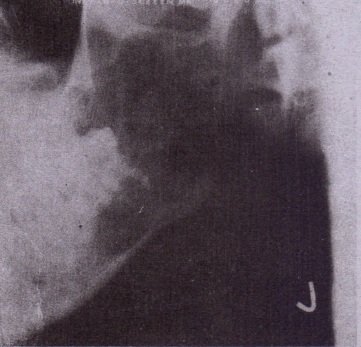 The appropriate time for enucleation is when bone is covering adjacent vital structures, which prevents their injury during enucleation, and when adequate bone fill has provided enough strength to the jaw to prevent fracture during enucleation (se Fig. 22-7). FIG. 22-7-cont’d E, Cystectomy easily performed .13 months after initial marsupialization. the wound cannot be achieved, packing the cavity with strip gauze impregnated with an antibiotic ointment is acceptable. This packing must be changed repeatedly with cleansing of the cavity until granulation tissue has obliterated the opening and epithelium has closed over the wound. cells could proliferate into a recurrence of the cyst. of bone around the complete periphery of the cystic cavity. This should be done with extreme care when workingproximal to important anatomic structures. 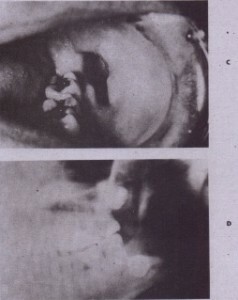 The cavity is then cleansed and closed.